It is often hard to be a mother. When we worry for our children, it is often a difficult test of faith. We mothers often find it hard to let go and let God. So often in counseling or the confessional I come across grieving mothers. Mothers who are so terrible concerned for their children who are straying–mothers upset about their childrens’ loss of faith. Mothers worried about their children’s choice of spouse, their grandchildren’s religious education, their children’s career choice. You name it. The typical male response is, “Get over it.” But I realize that the mother has a bond with the child that the father doesn’t really understand. Mama finds it difficult–very difficult to let go. So it is. Life is about letting go, not grabbing. We must, in the end, let go of all things and go out of this world naked and alone–just as we came into it. Life is a preparation for this final letting go, and therefore we should start practicing how. Throw the lumber overboard! Life is a casting off. This is where the devotion of the Seven Sorrows of Mary can help women. 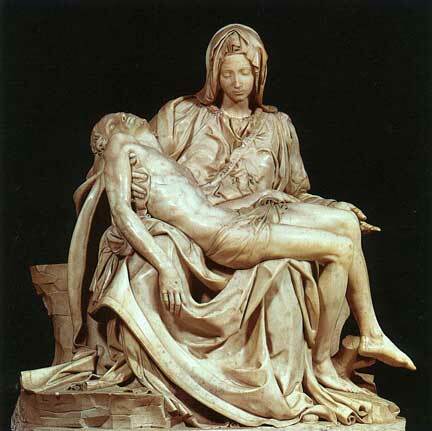 In the seven sorrows the Blessed Mother struggles to cast off. Of all women she has an even closer bond to her child than others. Because she has the perfect bond with her son, the tearing away of motherhood is even more poignant and painful. Identifying with her sorrows through this devotion can help women make sense of their own suffering with their families. The poet Wendell Berry reflects that for parents, the only way is hard. We who give life give pain. There is no help. Yet we who give pain give love; by pain we learn the extremity of love… In other words, it may be different in another world, but in this world, all love requires a sacrifice, and with that sacrifice there is inevitable pain. To reject sacrifice as the condition for the possibility of love is to live an essentially loveless existence. Wow. Unless we grieve like Mary at his grave, giving him up as lost, no Easter comes. This entry was posted in Blessed Virgin Mary and tagged Mothers, Our Lady of Sorrows, suffering. Bookmark the permalink. Mary, our mother, teach us to pray. This is one of my favorite lines when I listen to the rosary on KWKY. It summarizes exactly my outlook on life, my philosophy of life… I’m a very happy & content person and I always look at the glass half full. However, I’m often considered “heartless” because I do find it easy to let go, to “get over it”. My love for my Lord & His unconditional love for me keeps me going forward embracing life & accepting the downs with the ups in the same loving way. Thank you for this beautiful post day… I will share it with my friends!